Objekte in Heiligenblut am Großglockner mit durchnschnittlich 4,7 von 5 Sternen. Ausstattung 3: Ferienhaus Almhütte "Gipper"
Blick auf die 3000 Berge im Nationalpark Hohe Tauern. Ausstattung 32: Blick auf die 3000 Berge im Nationalpark Hohe Tauern. 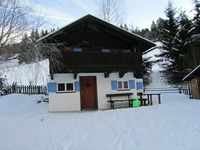 We &acute;ve spent extraordinary 4 skiing days with our friends (20 people) in Heiligenblut in Barbara&acute;s vacation home. Barbara is the most suportive and friendly host I have ever met. Thank You Barbara ! We&acute;ll definitly try to visit Your place in the future again ! Recommendation to all visitors, who do not search just for luxury but for clean, spacious accomodation with perfectly equiped kitchen and roomy dining room.